I have the privilege of taking a macroeconomics class that uses a textbook by Greg Mankiw, former economic adviser to George W. Bush. Which has been kind of weirdly enjoyable, because Mankiw presents such a caricature of economics that it’s really easy to pinpoint weaknesses of the field. His text, for instance, offers absolutely no critique of GDP – he mentions that GDP doesn’t cover the informal sector, but makes no mention of why GDP might be a problematic measure of national well-being. International trade in goods and services can improve the economic well-being of a country’s citizens. Trade is, in some ways, a type of technology. When a country exports wheat and imports textiles, the country benefits as if it had invented a technology for turning wheat into textiles. A country that eliminates trade restrictions will, therefore, experience the same kind of economic growth that would occur after a major technological advance. This has got to be the weirdest and least compelling defense of Ricardian comparative advantage I have ever read. Poor nations have not only lower levels of capital accumulation… but also inferior production capabilities… a second reason capital might not flow to poor nations is that property rights are often not enforced. […] Whichever of these two reasons is correct, the challenge for poor nations is to find ways to reverse the situation. If these nations offered the same production efficiency and legal proetctions as the U.S. economy, the direction of international capital flows would likely reverse. The U.S. trade deficit would become a trade surplus, and capital would flow to these emerging nations. Such a change would help the poor of the world escape poverty. I like how Mankiw manages to, in one stroke of ingenious logic, blame poor countries for being poor and for perpetuating the U.S. trade deficit. How should policymakers try to promote growth in the country’s natural level of output? Should policymakers try to stabilize the economy? How costly is inflation, and how costly is reducing inflation? How big a problem are government budget deficits? Economics as a means, not an end: perhaps that’s part of what Mankiw is missing. I was fast-tracked to the social sciences from pretty early on and have never really managed to escape. 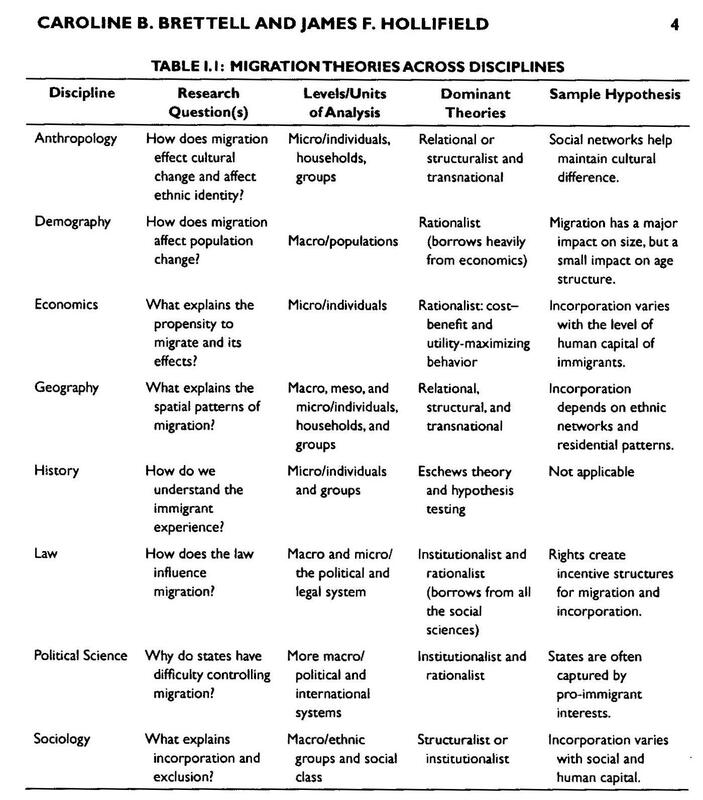 I majored in one and have played around in most of the others, but I realized over the course of the last week that I couldn’t explain the foundational beliefs that impact how each field approaches migration theory. Which is a problem since it means I can’t competently decode the migration-related writings coming out of each one. So simple. Yet so, so incredibly helpful. Given a pair of clickable ruby red slippers, I would wish for something like this to be required for the introduction to any multi-disciplinary text. The overlap of migration and military policy. Or how the Hmong came to the US. Except that the we didn’t really want to respect that neutrality (to be fair, no one else did either). The US had been providing covert support to the anti-communist Royal Lao army since 1955 as they struggled against the Communist Pathet Lao for control of the country. But we wanted to step up our game, because Eisenhower, and then Kennedy after him, believed that if Laos fell to Communism, Thailand, Cambodia, South Vietnam, and Burma would be right behind. And so, a cadre of CIA advisors were sent in to train a secret guerrilla army of Hmong soldiers to fight the war by proxy. Continued under Johnson and then Nixon, this secret army eventually grew to more than 30,000 strong. There is a lot about this story that is complicated. Some call the Hmong mercenaries. And, for the most part, they were paid. But it was $3 a month compared to the $200-$300 per month an army private in Vietnam received. Not all of them signed up voluntarily as many villages had solider “quotas” they had to fill to avoid punishment. And displaced from their farmland by the bombing in Northern Laos, few had real alternatives. For a more detailed (and better!) summary, Anne Fadiman gives a stellar primer on the subject, as I alluded to here. The story actually first broke in 1987 when a British investigative journalist wrote The Ravens: The Men Who Flew in America’s Secret War in Laos (which I haven’t read, but is supposed to be good). American planes airlifted between 1,000-3,000 high-ranking army officers and their families to Thailand, leaving tens of thousands of vulnerable Hmong behind. After the last American place took off, many of those remaining began the long and dangerous journey to Thailand, where they would spend years, even decades, in refugee camps along the border. Others tried to stay and survive the Vietnamese persecution. Some were successful, others ended up following the first wave to the Thai border. And so. We ended up with a sizable Hmong community in the United States. And, well, no one really knows (or remembers) that that’s why they’re here. Because we asked them to fight a war for us so that we could avoid international condemnation for violating the Geneva Accords we had, in fact, signed. I don’t know; I wasn’t there–but I’d bet good money that when the CIA was enlisting the first Hmong military leaders, promising that they’d help if the war turned against them, they had no idea what more than 200,000 Hmong refugees and immigrants in the United States would mean 50 years later. 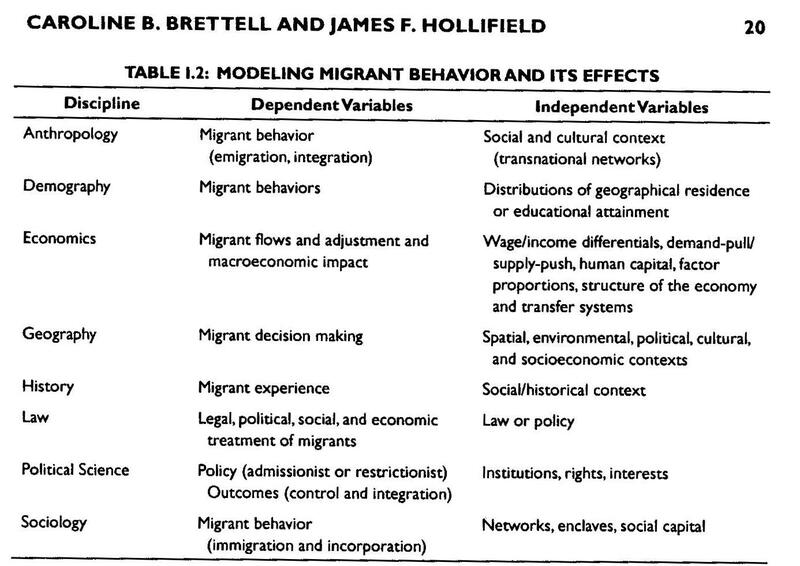 Military decisions catalyze migration decisions. We’re terrible at anticipating them ahead of time. But it’d be nice to at least see them acknowledged in hindsight. I just finished reading The Spirit Catches You and You Fall Down by Anne Fadiman, and I can’t recommend it strongly enough. 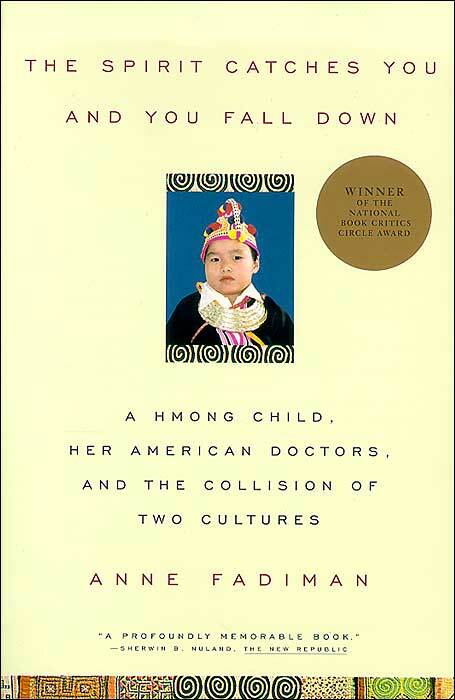 As you can see, the front cover says, “A Hmong child, her American doctors, and the collision of two cultures,” which is a rough but fair summary. The Hmong child is Lia Lee, born with severe epilepsy; the book’s title is the literal translation of the Hmong phrase for the condition. Since it was published in 1997, the book has been well-received (and rightly so); no excuses for why I’m so late getting to it. I’ll start out by saying that it’s a well-written, well-researched, insightful, and compelling book. But there is a lot that makes it exceptional. There are a multitude of angles at work: Lia’s parents’ interactions with her doctors in the 1980’s; the subsequent efforts of the author to gain the trust of both the Lee family and the medical community to research the book; an ethnography of the Hmong belief system; a history lesson of how the Hmong came to migrate to the US in such large numbers (more on that later); and a complex look at the process of assimilation–for both immigrant communities and the communities that receive them. I can think of several instances when I was living abroad or working with immigrant or refugee communities here in the States when despite what I thought was a crystal clear explanation, followed by another crystal clear explanation, preceded and followed by lots of questions on my part and that of the other party to ensure comprehension, the other person then went and did the exact opposite of what I expected (or I did the exact opposite of what they expected). Every now and then, I managed to unravel what happened. But usually, I just walked away frustrated and confused. Fadiman takes years of these interactions, after which both parents and doctors are so confused and frustrated that their willingness to share their story at all is a miracle, and pieces together what happened in the spaces between expectation and disappointment. Lia’s parent’s “non-compliance” with her medications serves as an example. Fundamentally, Lia’s parents believed that her epilepsy was the result of soul loss that occurred when Lia’s sister slammed the door too loudly and Lia’s soul was frightened out of her body. While they didn’t want their daughter to suffer unduly, epilepsy also confers status in the Hmong culture as it increases the likelihood of the child becoming a shaman. So while they wanted medical attention for Lia when aspirating a food particle during a seizure lead to pneumonia, they didn’t actually want the epilepsy completely cured and thought that medicines with negative side effects were unnecessary and, well, almost cruel. The parent’s worst fear (that Lia’s soul would never return) and the doctor’s worst fear (that Lia would enter into a continuous unstoppable seizure) were so far apart that the pursuit of each worked at cross-purposes with the other. Even absent Lia’s parent’s suspicion of the American medical system (which the side effects helped to fuel), they simply didn’t believe the doctors knew what was best for their child. In return, the doctors’ lack of faith in the competence and care of Lia’s parents eventually escalates into her temporary removal from their care by Social Services. With Fadiman’s careful unpacking, it all makes so much damn sense. And, as the reader, you find yourself deeply empathizing with almost everyone. But the narrative is long and complex, and Fadiman is unfailingly evenhanded–throughout the book, you can see her choosing phrases and frames with the utmost care. I don’t think I could have made sense of the story without such a skilled guide, and that admission reminds me of how far I have to go. I–and so many others who work across cultures–need to read more and more of these accounts, until the two-way decoding becomes an in-the-midst-of-chaos instinct. I’ll be deep into migration over the next four months. Next up on the reading list are The Warmth of Other Suns and Arrival City. Stated a bit more definitively than my last post of this nature, “Ten Books I’d Read” – although there is some overlap between that list and this one. Here are ten books I will definitely read this year. Consider it a resolution. Maybe I’ll even discuss them all on this blog, but don’t consider that a resolution. These are more historical and less theoretical than a typical list I might make, which is somewhat curious. In any case, should be an interesting journey. My previous post was a bit stream-of-consciousness, and I think I have a more comprehensible version somewhere in my brain. In a nutshell: I think Sen is too individual-oriented. His theory has no room for the fact that individual freedoms do not exist in a vacuum: they often conflict with each other. Given the nature of resource and power inequality in our world, if we were to try to magically give everyone freedom of self-determination, those with more resources and power would quickly infringe of the freedoms of those with less. Or, to borrow an idea from a classmate, Sen seems to view freedom as a sort of public good, non-rivalrous and non-excludable. But any structural or power analysis would lead to the conclusion that freedom acts more like a private good: consumption of the good does reduce its availability for others. To believe otherwise would indicate either an extraordinarily optimistic view of human nature or a complete blindness to systems and structures. Why does this matter in practice? Because changing what we measure from income to freedoms (or, to put it into indicator-ese, from GDP to HDI [for example]) isn’t enough. It’s a step in the right direction. But the world of development indicators and development practice needs an additional level of analysis, one that considers unequal power relationships and offers methods for mitigating or minimizing them.